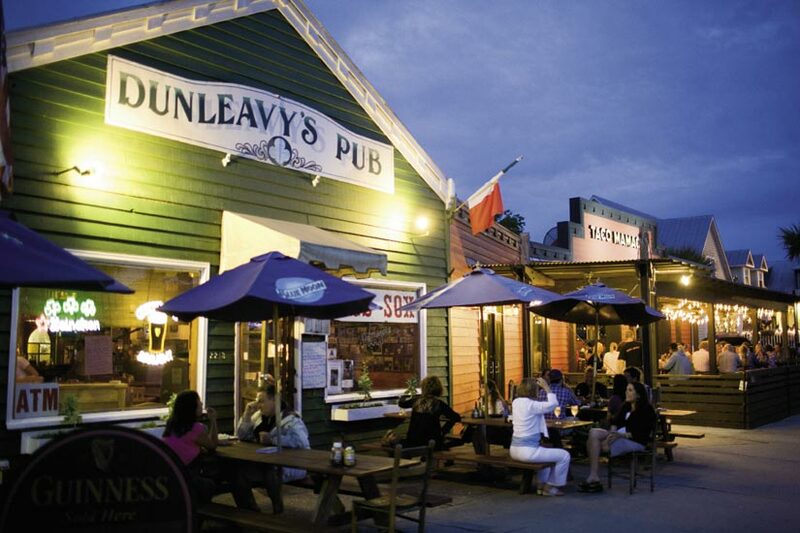 Dunleavy’s serves up live music on Tuesday and Sunday evenings along with pub fare. 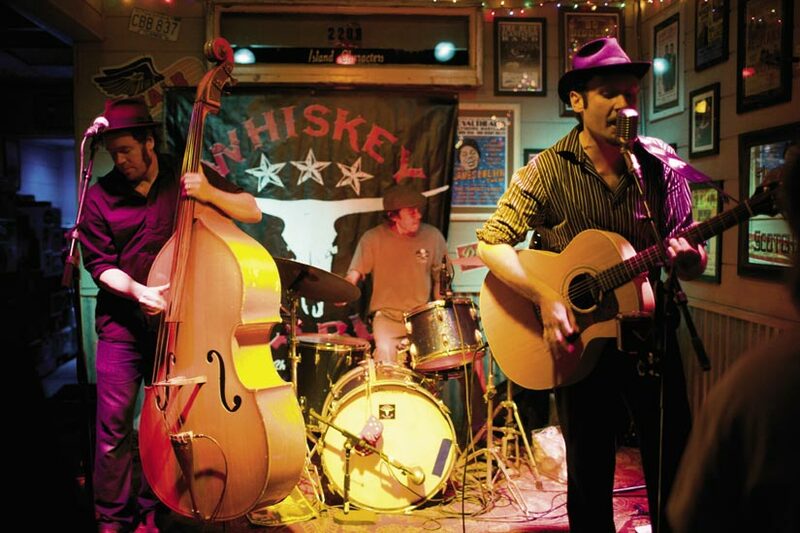 from the rowdy rockabilly of Whiskey Diablo (above) to reggae. 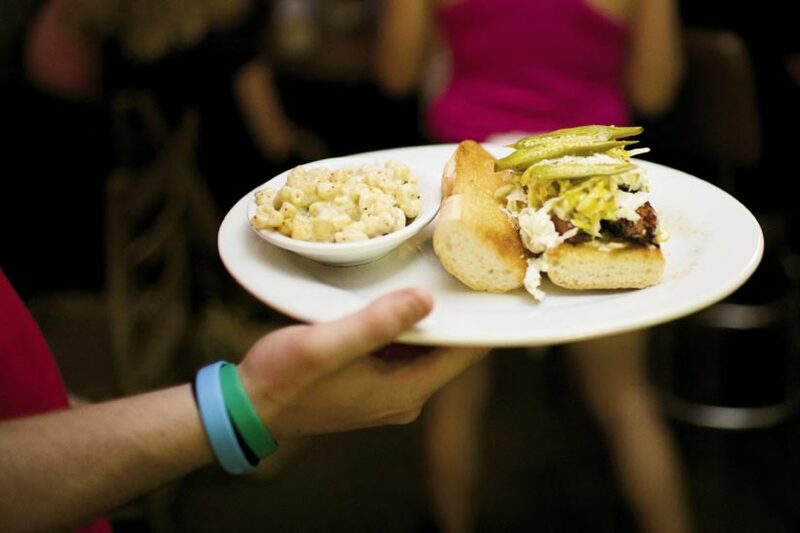 Grab a coveted seat on the Poe’s Tavern porch or patio for some of the best burgers and salads around. 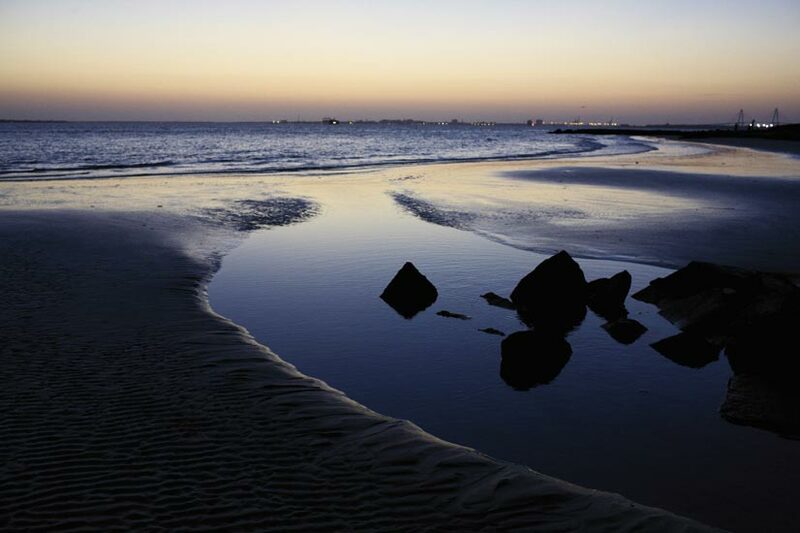 the beach near the Sullivan’s Island lighthouse provides a unique lookout to catch the rising moon. If F. Scott Fitzgerald had set his Roaring ’20s masterpiece, The Great Gatsby, in the American South, he’d have found an apt locale in Sullivan’s. Despite having a Who’s-Who cast of neighbors (including novelist Dorothea Benton Frank and former S.C. first lady Jenny Sanford) and some of the priciest real estate on the East Coast, there’s nothing overtly haughty about this retreat, as long as you mind your Ps and Qs. Pull up a stool at Poe’s or High Thyme on Middle Street, and you’re likely to overhear a house painter laughing it up with a stockbroker just home from a work-week up North. With Fort Moultrie’s cannons guarding Charleston Harbor at the island’s southwest tip and an iconic lighthouse warning seafarers of the offshore shoals, Sullivan’s offers the area’s most idyllic, well-preserved window into the Lowcountry’s coastal past. Listen close as you walk the sleepy dunes at dusk and you just may hear the haunting whispers of Edgar Allan Poe’s island muse. For an island with a tiny business district, Sullivan’s Middle Street manages to pack a punch. After downing a Guinness at locals’ favorite Dunleavy’s Pub, step into Taco Mamacita for a “Black Cadillac” margarita. Just a few doors down, long-time patrons of Bert’s Bar (R.I.P.) found some relief when Home Team BBQ opened up shop, keeping a solid lineup of regional blues and rock bands booked on the island. 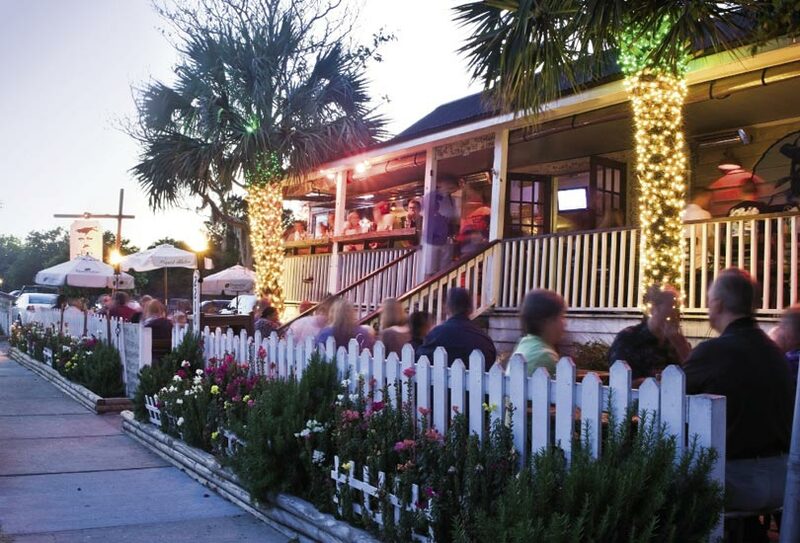 Across the street, it’s easy to feel at home on the front porch of Poe’s Tavern, a quality eatery that fills in with the beach’s young professional crowd every weekend. Keep in mind this is a mostly residential island with strict noise ordinances, so keep the hootin’ and hollerin’ to a dull roar, especially after 11 p.m. on weekends. Head to the southwest tip of the island and you’ll immediately feel the immediacy of your surroundings. The vantage point where the beach curves into Charleston Harbor is dramatic, with Fort Sumter and Morris Island across the expanse and the downtown peninsula just a skip away. 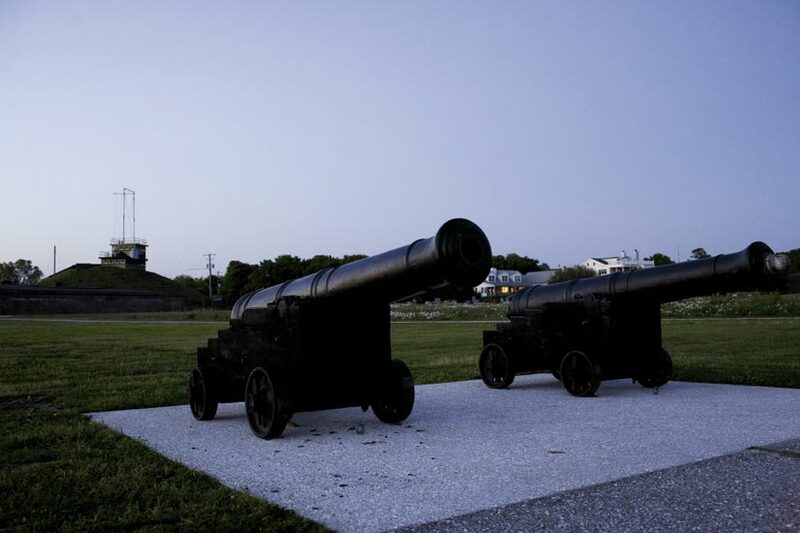 Fort Moultrie stands proud here, resting on its laurels after two centuries of defending the harbor mouth during both the Revolutionary and Civil wars, as well as World War II. Although the fort closes at 5 p.m., the grounds around it remain open all night. Stroll out past the cannons in the adjacent field and imagine a village of canvas tents, soldiers nervously awaiting an attack from across the water. With the city lights of modern Charleston glittering on the harbor, it’s a magical place to find solitude and reflect on our forebears. Macabre author and poet Edgar Allan Poe called Sullivan’s Island home for more than a year during his deployment at Fort Moultrie in 1827. His legend is just one of many that inspires haunting tales told among the beach’s historic mansions and sprawling dunes. 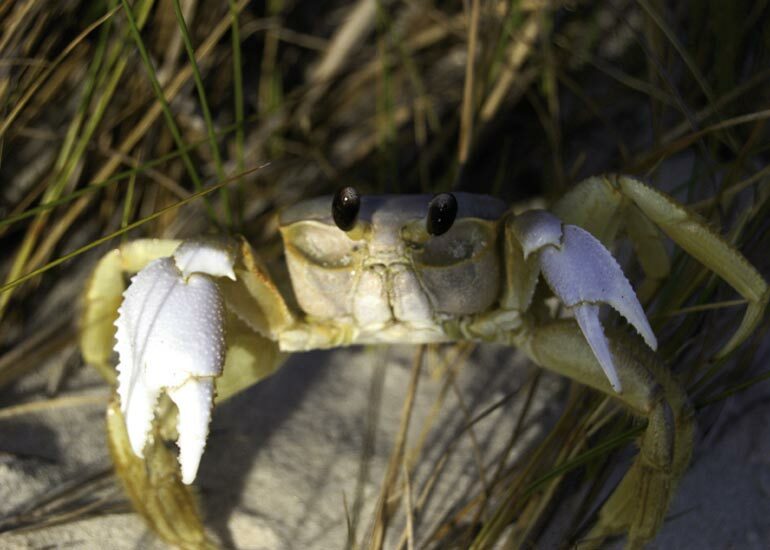 For a real sort of specter, however, there are plenty of ghost crabs to be found along the beach. It’s best to bring children along to keep excitement high, each armed with a flashlight and strict instructions not to chase or capture the nervous crustaceans, who often freeze in their tracks when caught in a beam of light. Although not as historic as the Morris Island Lighthouse, Sullivan’s Island’s white-and-black triangular structure is this beach’s iconic focal point. 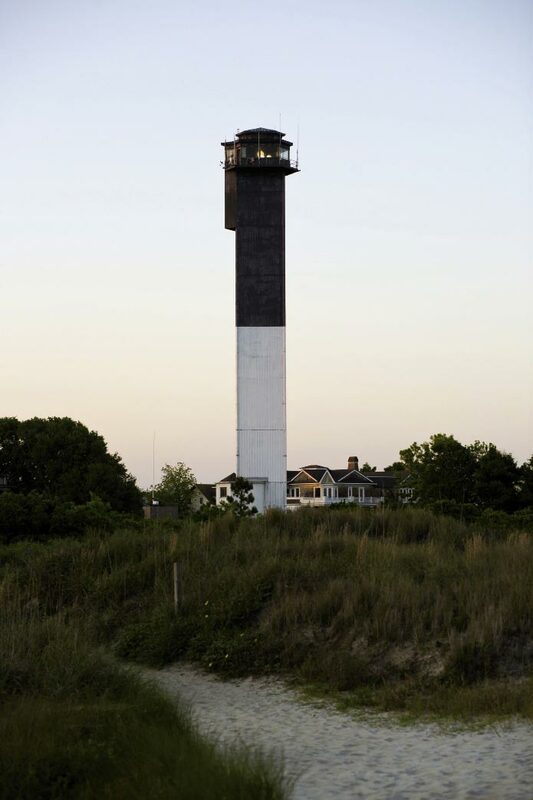 Activated in 1962, it was the last major lighthouse built by the U.S. government. Although it’s not open for the public to climb, its geographical site, marking the mouth of Charleston Harbor, offers an ideal vantage point to the east. Head here before dusk (or anywhere north of the lighthouse on Sullivan’s or IOP) for a full moon rise, and you’ll witness our glowing satellite orb emerging from the ocean’s depths in all its splendor. 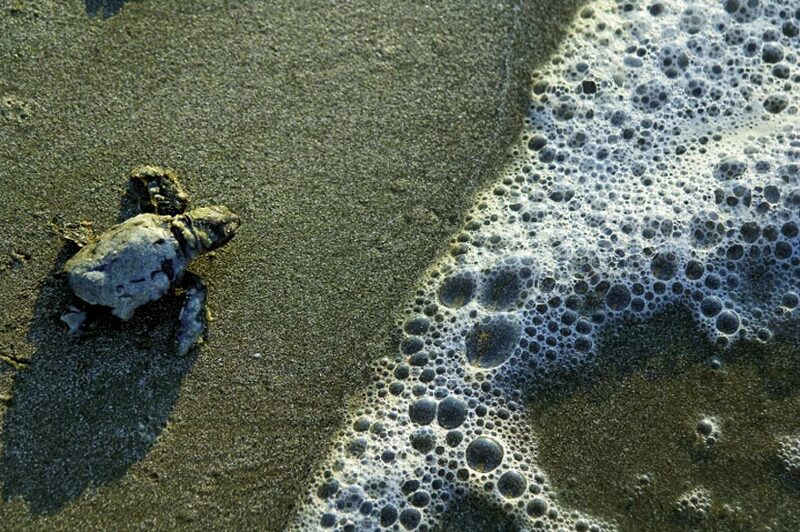 Even if you’re a local, it’s not easy to see a sea turtle in the wild. Some folks get lucky from a boat on the ocean, but catching a glimpse of a mama turtle laying her eggs or the hatchlings flopping out toward the surf in July and August is extremely rare. Fortunately, the Island Turtle Team opens their nest inventories to the public. Relying on a group of dedicated volunteers who walk the beach at sunrise every morning to spot signs of new nests, the organization posts each hatch on their website. Come out to the location of the nest three days later at 7 a.m., and you’ll have a very good chance of witnessing a few stragglers as the team lovingly guides them toward the water.